One of the most common joints used for joining the rails and legs of tables, chairs and other type of furniture is the Mortise and Tenon joint. 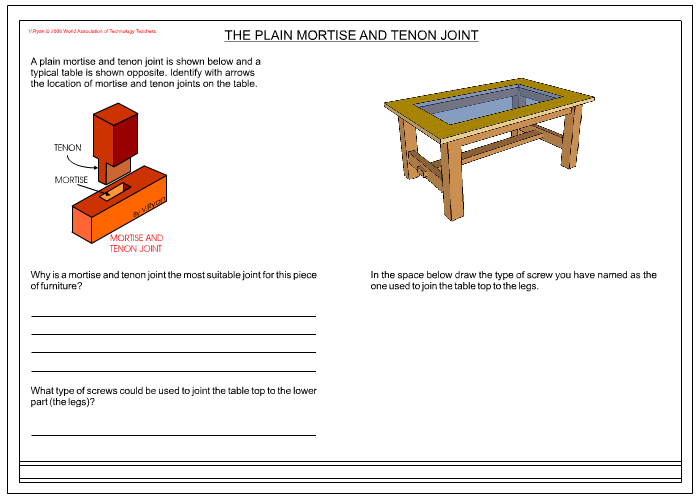 A large range of mortise and tenon joints exist and the most simple of these is shown below. The tenon is the part that fits into the mortise. A glue such as PVA or cascamite is applied before the joint is pushed together. Clamps are used to hold the joint firmly together, usually for twenty four hours. This type of joint could be used to join the legs and rails of a table together because they are strong effective permanent joints. If a good glue such as PVA or Cascamite is used the joint would be very unlikely to break apart. PDF FILE - CLICK HERE FOR PRINTABLE VERSION OF EXERCISE SHOWN BELOW.